During the night last night I heard torrential rain. ants crawling over my hands and up my sleeves. Labels: Watercolour and black marker on Arches watercolour paper. Barbara Muir © 2012. Toronto. Canada. This is such a beautiful painting Barbara. 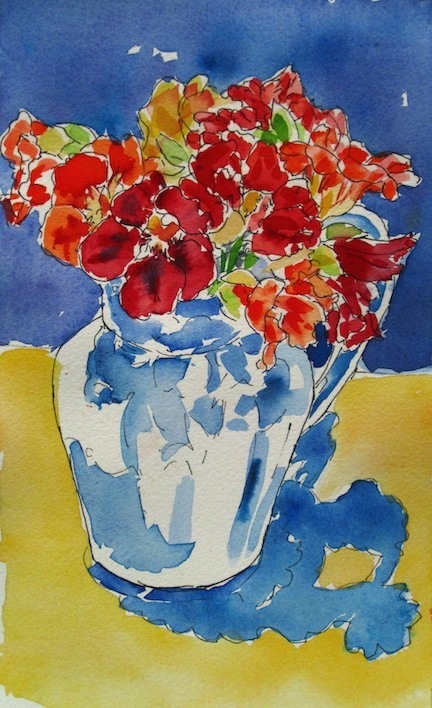 A classic Barbara Muir with it's joyous colour and vibrant subject... your personality on paper! Thanks Nicki. I am working on more prolonged commissions I can't show until they're done and accepted. So these are the perfect paintings for display right now. The garden is co-operating, and I can't help but be moved at its bounty.